Akaw has a little face that will melt your heart! It will be interesting to see him grow and what this face looks like as an adult. His coloration and rosetting will be a softer silver in color similar to mom Argyria. Akaw and his siblings, Choka, and Zamba are just starting to really play and show their personalities. All three are very outgoing and are sure to be mischief makers just like mom! 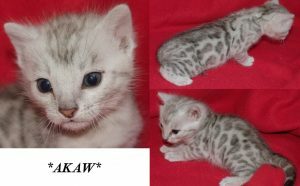 This entry was posted in Bengal Kitten Gallery and tagged Akaw, Bengal kitten, Silver Kitten. Bookmark the permalink.